Be the first to share your favorite memory, photo or story of Joseph "Marty" . This memorial page is dedicated for family, friends and future generations to celebrate the life of their loved one. 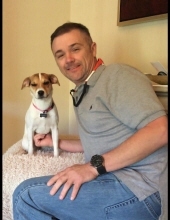 Joseph “Marty” Lamar Herrin, 44, passed away Saturday, March 16, 2019 at Optim Medical Center. He was born August 12, 1974 to Lamar and JoNell Stanfield Herrin and lived in Glennville and Atlanta. He was a 1992 Graduate of Glennville High School and employed for the past fifteen years with American Red Cross as a Supervisor Manager in the Atlanta area. He is preceded in death by his father, Lamar Herrin, brother, Tracy Herrin. Nephews, Trevor Herrin and Trenton Herrin, canine special friend, Sadie Mae, several cousins, aunts and uncles also survive. Visitation will begin at 6:00 pm, Wednesday, March 20, 2019 at Brannen Kennedy Funeral Home. Funeral Services will be held 3:00 pm, Thursday, March 21, 2019 at the chapel of Brannen Kennedy Funeral Home. Burial will be in Stanfield Family Cemetery. Brannen Kennedy Funeral Home of Glennville is in charge of the arrangements. To send flowers or a remembrance gift to the family of Joseph "Marty" Lamar Herrin, please visit our Tribute Store. "Email Address" would like to share the life celebration of Joseph "Marty" Lamar Herrin. Click on the "link" to go to share a favorite memory or leave a condolence message for the family.